It’s tough: knowing that you might not get the world you want and the world that wants you back, that your bones might never stop feeling achy and fragile from the wear and tear of mere existence, from the hard labour of getting through the day. Ours are bodies that have been depleted by time, that have been wrenched into a world they can’t properly bend or squirm into because our flesh is paradoxically both too much and not enough for it. In the wake of both eventful and slowed kinds of premature death, what does it mean that the state wants so eagerly to move Indigenous bodies, to touch them, so to speak? Reconciliation is an affective mess: it throws together and condenses histories of trauma and their shaky bodies and feelings into a neatly bordered desire; a desire to let go, to move on, to turn to the future with open arms, as it were. Reconciliation is stubbornly ambivalent in its potentiality, an object of desire that we’re not entirely certain how to acquire or substantiate, but one that the state – reified through the bodies of politicians, Indigenous or otherwise – is telling us we need. In fact, Justice Murray Sinclair noted that the launch of the Truth and Reconciliation Commission’s final report on December 15, 2015, puts us at the “threshold of a new era in this country.” I am interested in how life might be lived willfully and badly in the face of governmental forms of redress when many of us are stretched thin, how reconciliation, though instantiating a noticeable shift in the national affective atmosphere, doesn’t actually remake the substance of the social or the political such that we’re still tethered to scenes of living that can’t sustain us. What I am trying to get at is: reconciliation works insofar as it is a way of looking forward to being in this world, at the expense of more radical projects like decolonization that want to experiment with different strategies for survival. This way of doing things isn’t working and, because of that, optimism is hard to come by. According to cultural theorist Ann Cvetkovich, political depression emerges from the realization “that customary forms of political response, including direct action and critical analysis, are no longer working either to change the world or to make us feel better.” It is the pestering sense that whatever you do, it won’t be enough; that things will continue uninterrupted, teasing you because something different is all you’ve wanted from the start. To be politically depressed is to worry about the temporal reach of neoliberal projects like reconciliation, to question their orientation toward the future because the present requires all of your energy in order to feel like anything but dying. Political depression is of a piece with a dispossessory enterprise that remakes the topography of the ordinary such that the labour of maintaining one’s life becomes too hard to keep up. We have to wait for the then and there in the here and now; how do we preserve ourselves until then? As Leanne Simpson points out, reconciliation has been reparative for some survivors, encouraging them to tell their stories, to keep going, so to speak. But, what of the gendered and racialized technologies of violence that created our scenes of living, scenes we’ve been forced to think are of our own choosing? Optimism for the work of reconciliation disappeared in the face of multiple crises: of Missing and Murdered Indigenous Women and Girls, of HIV infection rates, of mass incarceration, of diabetes, of suicide. Reconciliation, at once a heuristic and a form of statecraft, fakes a political that doesn’t actually exist as such, one that not only presupposes that we – Indigenous peoples, that is – are willing to stay attached to it, but that we are already folded into it, that we’ve already consented to it. What does it mean, for example, to consent to a nation-to-nation relationship if there are no other options to choose from? Reconciliation wants so badly to be a keyword of sorts, to contain so much inside its semantic confines, to be “wide-reaching in its explanatory power.” I’m not surprised things have started to leak all over the place. Decolonization might need something of an affective turn: I think there are ways of being attuned to our bodies such that we can gauge if our visceral responses are trained or not, parasitic or not. 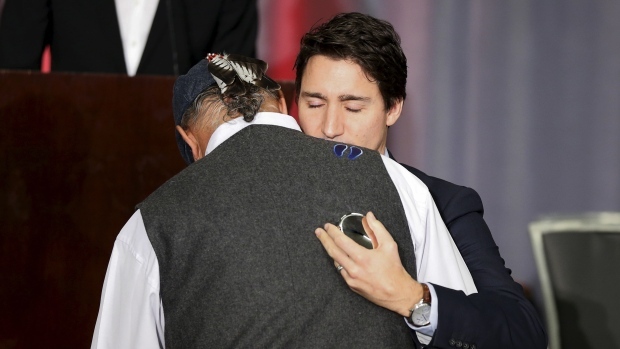 In short: what do our tears signal, what do his – Justin Trudeau’s – signal? We cry because pain holds our world together. I don’t want pain to hold our world together anymore. Perhaps admitting we are politically depressed is one of the most important things we could do in this day and age. When survival becomes radical and death becomes part and parcel of the ordinary itself, political depression might be our only point of departure. But, political depression is also about dreaming up alternatives that can sustain your attachments to life. Cvetkovich reminds us that we need “other affective tools for transformation” because hope and blind allegiance have failed too many of us too often. I am interested in the generative work of pessimism, how being fed up propels us onward, and keeps us grounded in the now, such that we can make it to the future, even if that’s just tomorrow. As Kim TallBear put it, we’ve been living in a post-apocalyptic world (in its ecological ruins and in the face of its crisis-making politics) for quite some time, one that exhausts our bodies to the point of depression and death and one that slowly removes us from the non-normative or the astray. We are stuck in the thick of things, left clinging to an impasse without an exit strategy. We might need reconciliation today, but Indigenous peoples need a more capacious world-building project for tomorrow, one that can bear all of us and the sovereignties built into our breathing. We should not be asked: do you want the world today? Instead, we should be asking: does the world want us? Billy-Ray Belcourt is from the Driftpile Cree Nation. He is a 2016 Rhodes Scholar-elect and is completing a BA (Honours) in Comparative Literature at the University of Alberta. He blogs and writes poetry at nakinisowin.wordpress.com. Lauren Berlant, “Cruel Optimism,” in Affect Theory Reader, Eds. Melissa Gregg and Gregory J. Siegworth (Durham: Duke University Press, 2012). Ann Cvetkovich, Depression: A Public Feeling (Durham: Duke University Press, 2012), 1. Cvetkovich, Depression: A Public Feeling, 13. Joshua LaBare and Kim TallBear, “Matters of Life and Death,” Anthropocene, Ecology, Pedagogy: The Future in Questions, December 15, 2015, https://www.youtube.com/watch?v=tjiVcwpBhSc. I’ve been thinking about “the astray” as a site of counter-world-building, a practice of being away from the correct or normative path or direction and a veering into a strange or unknown place or behavior. The astray is a fading geography, the space we go to go somewhere else. This is an amazing article so proud of you and what you are doing this article defines what is true in mainstream society and gives an insight to what not only First Nations belives but facts all Canadians are faced with at this time of financial instability.